I've got more kid's bedroom ideas for you today. As much as I love the IKEA Expedit shelving and diy desk I showed you last week. 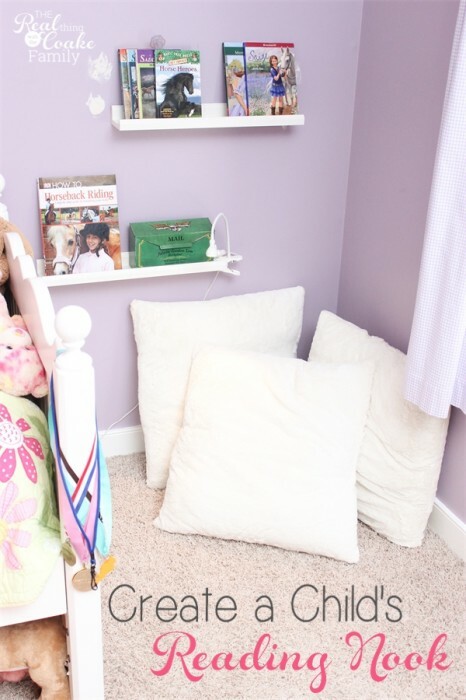 I think the reading nook I created in Pumpkin's room is my favorite element….well at least in her room. I do love the shelving and desk in the other room. The reading nook is just so cozy. I wish I had one in my room. Pumpkin LOVES to read. In an effort to give her something new in her room, since her big sister was getting new furniture, etc. I decided to make her a cozy reading nook in one corner of her room. 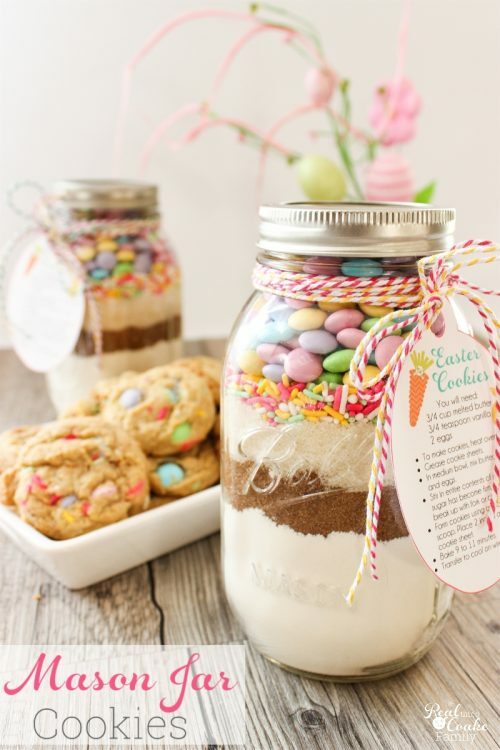 It was easy and inexpensive to create and Pumpkin LOVES it and uses it often. 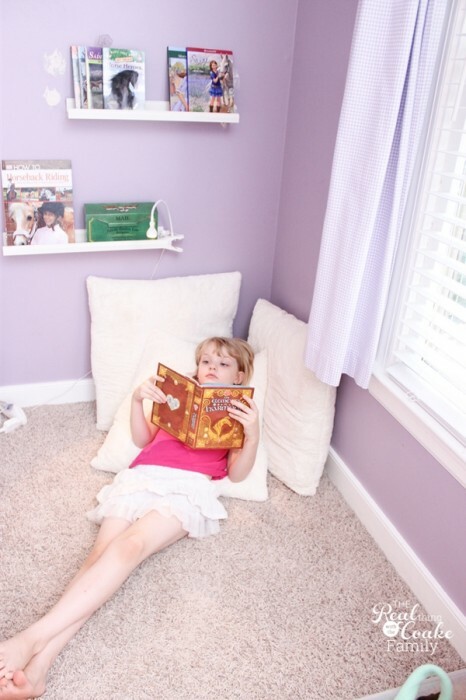 Let me show you how to create a reading nook in your house as well. Oh and if we could just ignore the fact that I need to paint her room and that the walls are patched but not painted, I'd be forever grateful…UmKay? In our reading nook, I wanted a place for Pumpkin to leave books she is currently reading. I bought two of these shelves on our trip to IKEA. They were in expensive and easy to install. 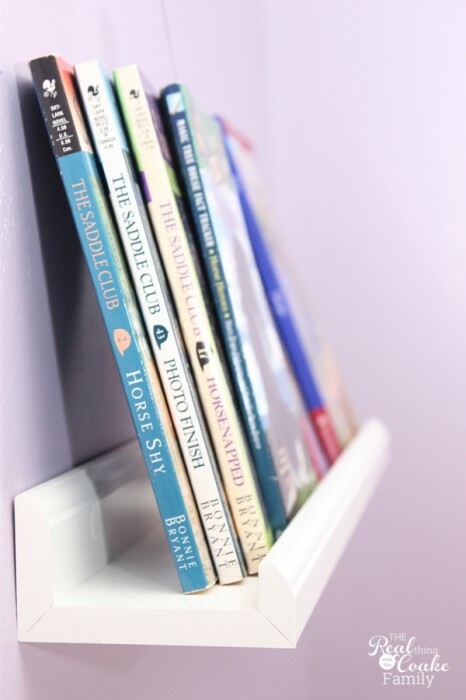 The directions for installation are included with the shelves. 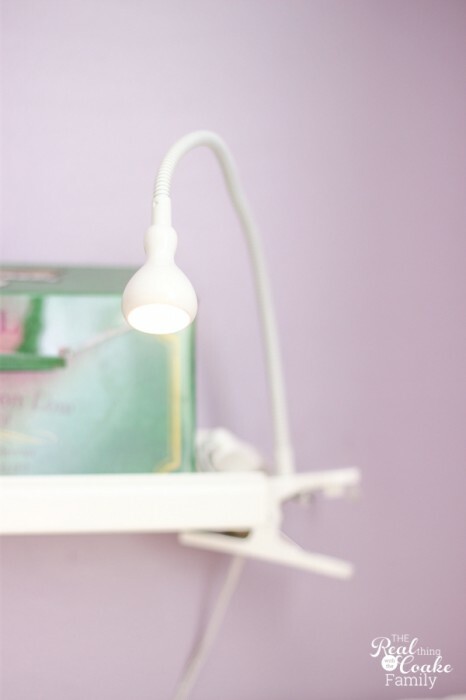 Light is a necessity in a reading corner. We picked a light at IKEA that could clip onto one of the shelves. You need some cozy pillows or a bean bag for your reading nook. I found these fluffy, furry white pillows on clearance at Target back in March. I found one at the Target near the IKEA store, which is 1.5 hours from our house. There are 3 or 4 Targets on the freeway on our way home. We stopped at each one and by the time we got home, we had 2 pillows and one bean bag (for Snowflake's room). Thankfully, the Target in our city had one more fluffy pillow on clearance as well! Whew…that was close. Lastly, you need to add a child, or yourself, and some great books. Pumpkin loves her reading nook. It is the perfect use for this area at the end of her bed. 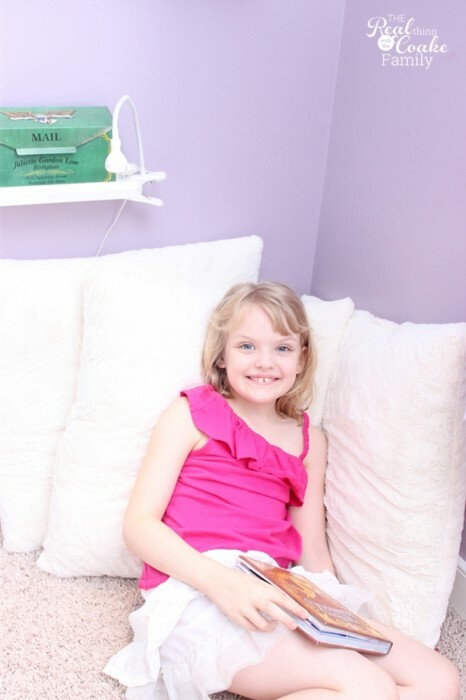 Now if I could just get her to leave her reading nook….I'd take over and stay a while myself. Not that I've ever done that or spent an hour reading there or anything. 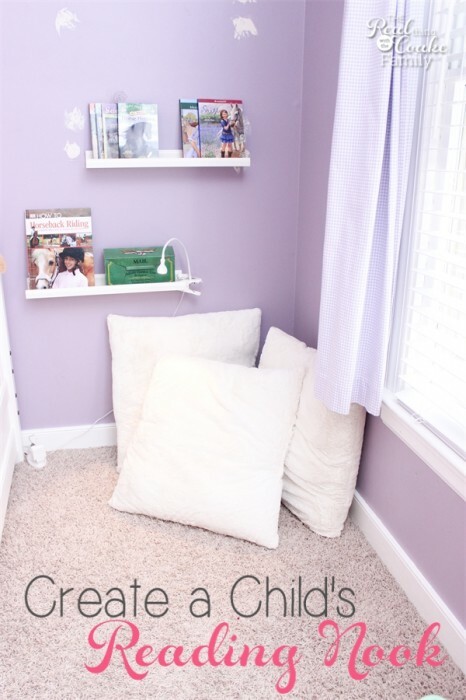 Trust me, the cozy pillows are the most important factor in making your reading nook cozy. They make you never want to leave….again, not that I've borrowed her reading nook area or anything. Do you ever ‘borrow' your child's room? 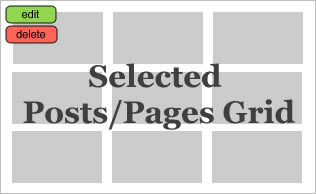 You know, like a cozy reading area in which you want to stay a while and read. Thanks Maureen! I do have the paint details. It is a Behr (Home Depot) color called Plum Frost color number 660F-4. It is a color we painted 7 or so years ago, so they may have re-done their color line in that time, but that was the correct info. Hope that helps.